If you've ever hosted a big family Thanksgiving, you know it's not just about preparing the dinner - you have to have snacks and goodies ready too. Because people get munchy waiting for the turkey to finish cooking. 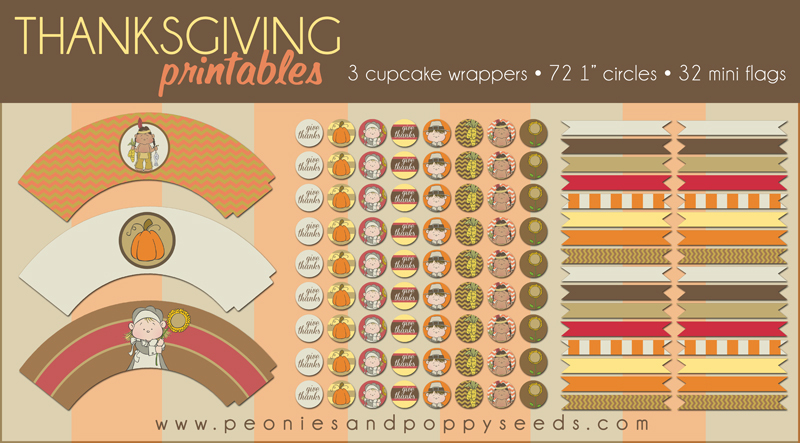 Click on the picture to download these free cupcake wrappers and toppers, or click here. Use the cupcake wrappers to go around the base of your cupcake and then top everything with one of the flags or 1" circles. Just adhere a flag or circle to the edge of a toothpick and insert the other end of the toothpick in the top of your cupcake. You can also use the little flags for straws in drinks or other stuff. And the 1" circles can be used for lots and lots of things - just get creative! And check back later this week, because we have other Thanksgiving stuff to make your big family get together a big success!